Confession: I’m an impatient DIYer. Which is why I’m usually all about quick and easy projects – I want it done and I want it now. Or yesterday. So when furniture needs a little loving, I ignore it as long as I can, because it’s not always easy or quick. Intricate parts can turn a seemingly simple makeover into an afternoon ordeal. Ain’t nobody got time for that. So anytime I can figure out how to speed up a process, I’m all about trying it. 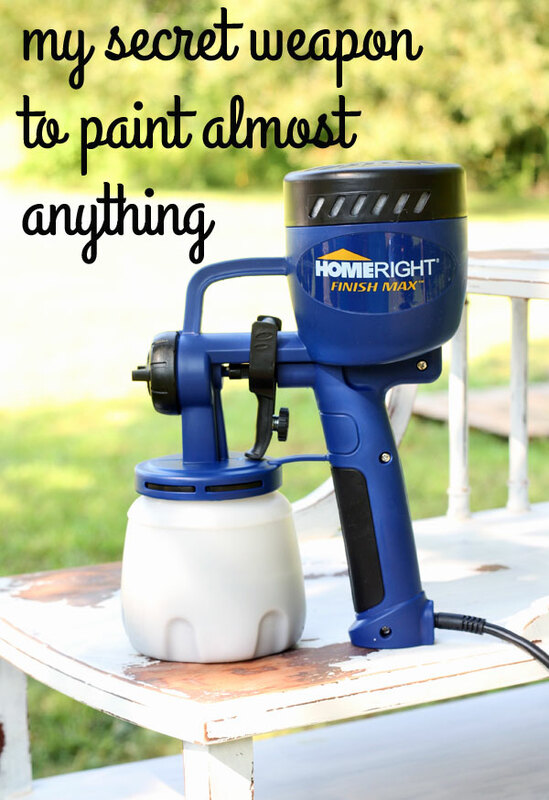 My friends at HomeRight sent me a Finish Max Sprayer to try – and I’m here to tell you I’ve now pegged it as my secret weapon to paint almost anything. Less than six months ago I painted this little table, yet the finish has been destroyed by way too many glasses of sweet tea. Which kinda makes me wanna cry. But, painting it again means that I can give it a new color and change things up a bit. However it took me over 2 hours to paint it last time, so I’ve been ignoring the issue. That’s why I knew this would be a good project. I sanded down the table to smooth out all of the damage, then wiped it all down. A little leftover paint & about 10 minutes with my Finish Max later and that was that. One last confession (because I’m full of them today! ): I was scared to clean the gun. I’ve used a few different sprayers over the years, and usually I sweet talk Mr. SCC into cleaning them, but he wasn’t here to do the dirty work. I was so pleased to find out that it took about 3 minutes to clean the whole thing. From start to finish in about 15 minutes? Can a project be any faster than that? Yep, I’d say that the new Finish Max Fine Finish sprayer is now my secret weapon to paint almost anything! I have been looking at many sprayer. How did it work hitting angles, hard to get areas, was it hard to hold, and did you have to hold it straight up and down to hit the areas? Hey Melissa! It was actually much lighter than I thought it would be. It hit all the angles great, even when I tilted it to hit the bottom shelf. It worked very similar to a can of spray paint, only a little bigger. But, the trigger is much easier to control than a spray can nozzle. Did you use primer? 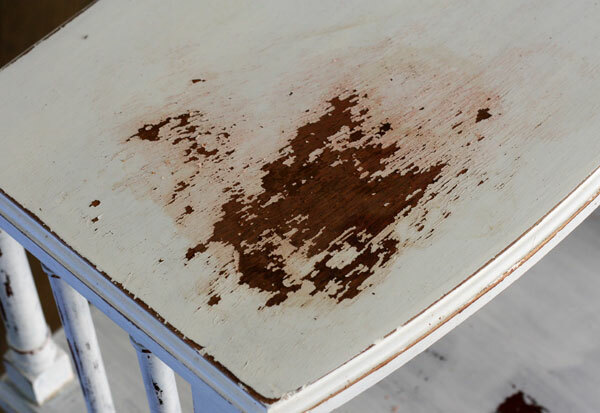 What time of paint did you use in the sprayer to get a nontacky finish on the furniture? No, I did not use primer, I just sanded it down a bit and used some left over latex paint. I just received the exact sprayer today!! So glad to bump into you! I cannot wait to try the many pieces waiting on me!! What kind of paint did you use for the table? Also, could it be used to “paint” a room? Of course after you have done all the edging. Does it need an air compressor? The table is SO pretty!!!!!! Nope, all it takes is an extension cord. It’s super easy to set up and use. That table really looks great in grey!! My husband and I have been talking about buying one very soon. We need to stain our fence and this would be perfect to use. I also seem to paint a lot of dining chairs and those spindles are always such a pain. I do believe we will purchasing one of these in the very near future! Oh- Thanks for the info. I have had horrible luck with paint sprayers in the past. It seems that the nozzle always is slightly “clogged” after the first use and I can never get it cleaned completely. How was the nozzle itself to clean? It was surprisingly easy to clean, I was actually shocked at how quick it went. The larger sprayer (that I used on the swings) was somewhat difficult to clean, but this one is a breeze! 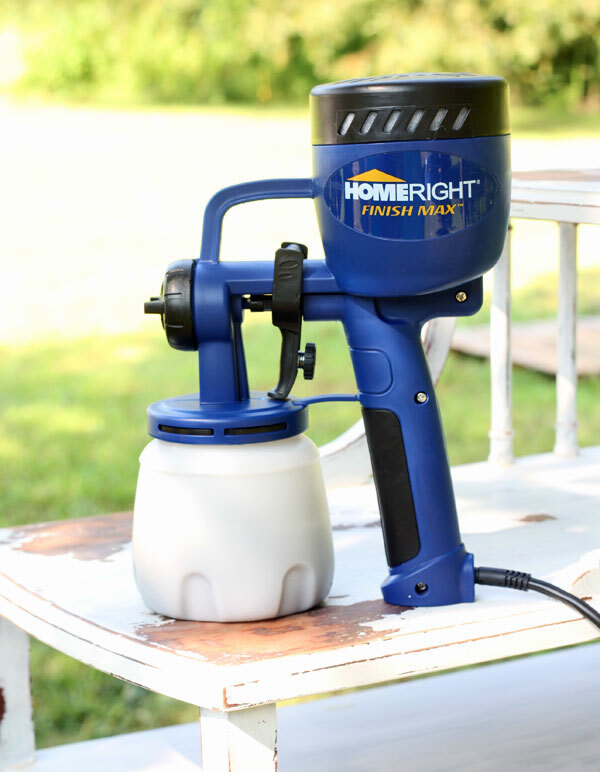 Thank you for trying out the HomeRight Finish Max Sprayer, I am so happy you liked it. The table looks great! 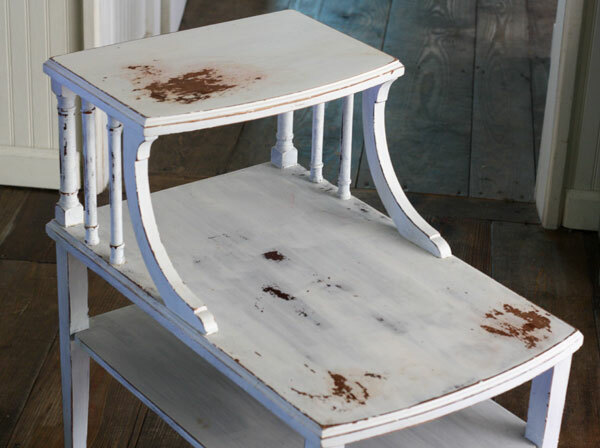 Have you ever tried spraying chalk or milk paint? No, but I do have some Miss Mustard Seed milk paint I want to try in it. I’ll let you know how it works! I am very curious to know how that works out! please let us know how it works out. 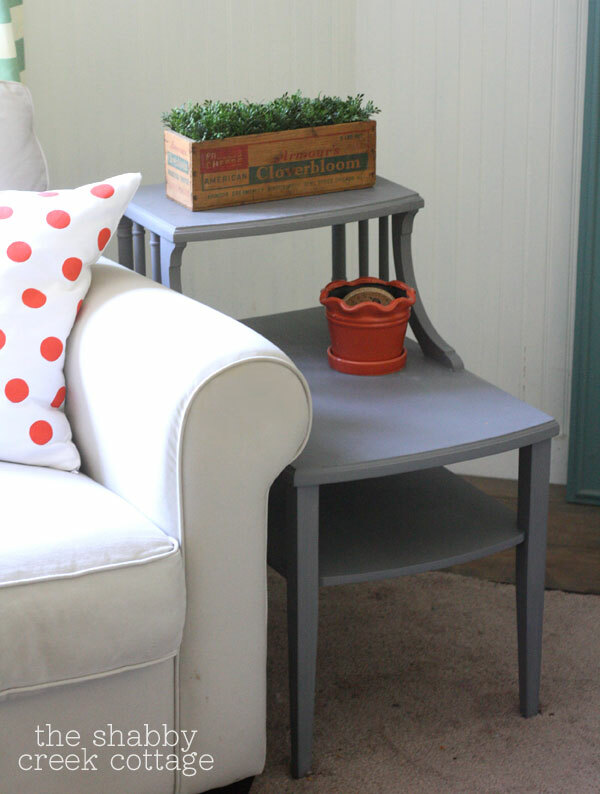 I have used DIY chalk paint (with Plaster of Paris) and ASCP in my Finish Max and it worked great! I love the HomeRight Finish Max…. use it all the time! Yes, I have that one and it is fabulous! I feel like I am cheating the spray can gods!!! there’s a gauge in with the gun that you can use to make sure you’ve got the consistency right – just check the instructions in the box. Looks so amazing! Do you spray outside? I always worry about the over spray and breeze with a spray gun. I sprayed this outside, but I’ve also sprayed in our barn when it’s windy, too. This looks like the perfect solution to painting the spindles on my stairs! It is very rare that I run right out and buy something that a blogger recommends. However, I saw your post about the Homeright Finish Max and immediately went to my favorite on-line store and bought it. I love trying to do the painting projects that you show on your site but my hands really hurt when working with spray cans. The sprayer came already and tomorrow, if the rain stops, I’m dragging one of my tables out to the lawn to try it out. Thanks for having such an interesting blog. How about using a rectangle vintage tray the same size as the top of the table. This way it could just stay there and no one would have to “remember” to use a coaster. I am so impressed with your review and the fact that I do not need an air compressor that I am going to order right now and let my husband surprise me with it for our 44th wedding anniversary. I was only 5 when I married him. Wink wink!!!!! HomeRite picked the right person to try and review this item. Let me know how the chalk paint trial goes. I bought this based on a review at Beneath My Heart and I love mine. I have used it for furniture and most recently for 6 cabinets in my laundry room and it is great. Did you thin your paint first? Initially I thinned it per the instructions utilizing that little device included but I think it was too thin the first time. Next time I thinned it a lot less and it worked even better! What are your thoughts? I thinned mine the first time, too, because after using their larger gun I thought it needed the same consistency — I was wrong. It barely needed thinning at all and worked great once I got the paint right. I haven’t yet, because you need to let paint cure for a while before sealing it with poly – but I will be soon! Iam going tomorrow and getting one of these paint sprayers! No more spray cans for me! 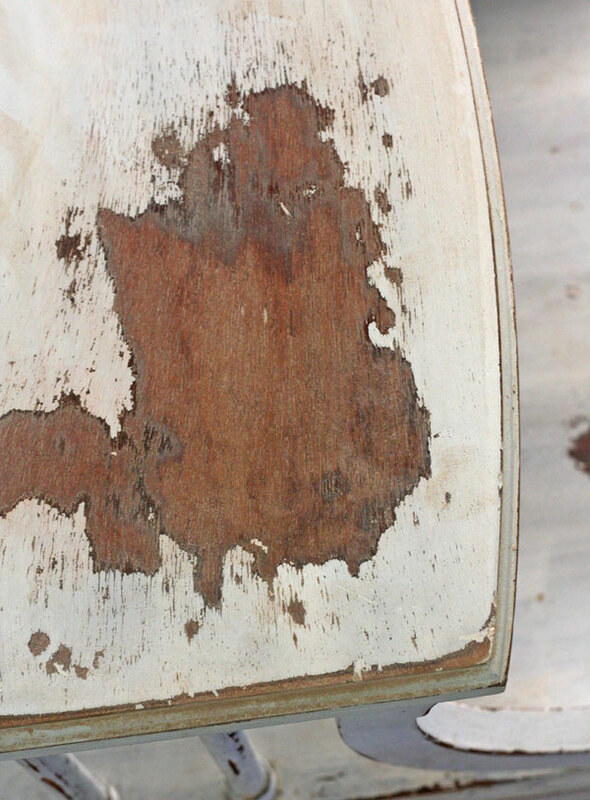 I am making shabby chic benches and this will be perfect and save me so much time! You mentioned that you let your paint cure before putting on the poly. How long do you generally let it cure? Thank you so much for all the great info! Maybe? Sorry, I haven’t tried it so I can’t say for sure. I’ll be using it soon for my kitchen, though, so keep your eyes peeled! I am looking to buy a spray painter, has anyone tired spraying Chalk paint? I was wondering the exact same thing!! oooooh. I totally want one! I have put off SO many projects because I haven’t had a sprayer. oooooh. Thanks for the review! I’ve been a very good girl this year so I should be able to get this! This looks great! How would it work for a floor? Would you have to bend over to spray or would it work from a standing height? Painting our basement floor was a back breaker! Thanks! We have been looking paint sprayers for a while now. Thanks for the recommendation Gina! I want to use for my kitchen cabinets. I have 24 doors and 16 drawers. A brush will take forever. BLESS YOU for this review!! We just bought 8 chairs with about a million spindles/carvings/details, and they need to be painted. I was trying to convince myself to just do it with a brush, but wishing I could spray them. Because who has that many hours to paint? This sprayer will be PERFECT!!!! Even with the cost of the new gadget, the chairs will still be a screamin’ deal, and will look gorgeous with the table that we already finished (by hand…sigh). Thanks for the tip on a good paint sprayer, let us know if you got your kitchen painted with it. I chuckled viewing your blog page because there is an ad for Tervis Tumblers… the glass that does NOT SWEAT. I hate when my drinking glass (usually a “make mommy happy drink” sweats and leaves water marks. My sister turned us onto Tervis Tumblers and I now have a Dz. (I told people that did not know what to get me as a gift TERVIS) They keep your ice from melting so fast and they also have lids that keep bugs or bee’s from thinking they can share my drink. We entertain a lot and I have never had a wet spot (from a glass since.) they are dishwasher safe and have a lifetime warranty…WINNER!! I have absolutely NO affiliation with the company I swear…but I should for all the referrals I have made. Cheers, and good luck with all your future Projects. I noticed that you used the the term”Hella-rough” and I just have to know if that is just an expression or if it is in reference to a name. My original name was Hella, and it’s not that common. I am happy to have discovered your site! An trying to get up the nerve to paint our kitchen cabinets. Just won the paint sprayer in the bloggers Spring Giveaway and I am so excited to hear from someone who actually uses it! Can’t wait to move and use it for the new place. Does is have a lot of overspray? Would love to be able to spray the walls, but don’t know if that is a good application or if I should stick to furniture, etc. Gina I just watched your interview on the Building a Creatively Made Business 2.0 course (late to get started) and ordered your book! Now I am looking at your site with “new” eyes! Always loved it but am developing a new appreciation. Thanks for the good info and advice! Thank you so much for introducing this uncomplicated paint sprayer and all your tips. I’ll definitely order one from Amazon. I am beyond excited to buy and give this a try…I have mounds of furniture to makeover. I had purchased a spray gun before (and returned it quickly!) all because when I painted, globs of paint would come out of the nozzle on one side. It was almost like the paint was too thick, so it just spit out in large chunks. I’m not sure if I was doing it wrong…maybe I needed to thin my paint first. Anything like this on your sprayer? Do you need to thin the paint first? It says on the Finish Max page that linked to that you can “Use this Fine Finish Sprayer with clear sealer, polyurethane, primer, stain and varnish.” Am I understanding that you used latex paint in it? And if so did you have to thin it? Also what finish; flat, satin, semi-gloss or gloss? Thanks for the info! I just have to purchase one of these! I just ordered this sprayer so I can paint our kitchen cabinets. Thanks for your info and postings! So excited to try my hand at DIY! You want to win the coaster issue? It’s real simple….go to a company that will cut you a piece of glass the size of your table. I have them on my bedroom furniture and end table in living room because of this issue! Saves time and your furniture! Can you use chalk paint with this sprayer? Thanks in advance ! Not sure if you are reading messages on older posts, but my partner Greg just used this sprayer for the first time today after my buying it when I saw this post a year or so ago. AWESOME!!! It cut the time so short for painting the deck on a rent house we’re selling. He was thrilled and so was I to see how easy it is to use. Cleaning could be easier with more parts to come apart…and if we had the brush it was to have come with. Not sure what happened to it, but I used the small end of a bottle brush. I’m eager to use it on my own projects after we move next month to Astoria, Oregon from Northern California. Looks like I bought the sprayer 2 years ago but didn’t use it as we decided not to paint the kitchen cabinets. Thanks for posting! I have just ordered this sprayer and can’t wait to try it on the bathroom cabinet doors that I’ve been procrastinating about….I searched other sites and this sprayer seems to have really good reviews for the most part! Thank you for this post – I have looking for something like this to help me tackle projects! Your posts are funny and are good inspiration for my own project blog 🙂 (triedandtrueprojects.com if you ever want to write a guest piece!) anyways, I think it’s a safe bet I will be picking up one of these in the very near future! Thank you! Just received 2 church pews and your instructions will help us greatly! So glad to see you post this. I have been thinking about a paint sprayer for a while. I have osteoarthritis and wondered about the weight and ease of use when it was full of paint.